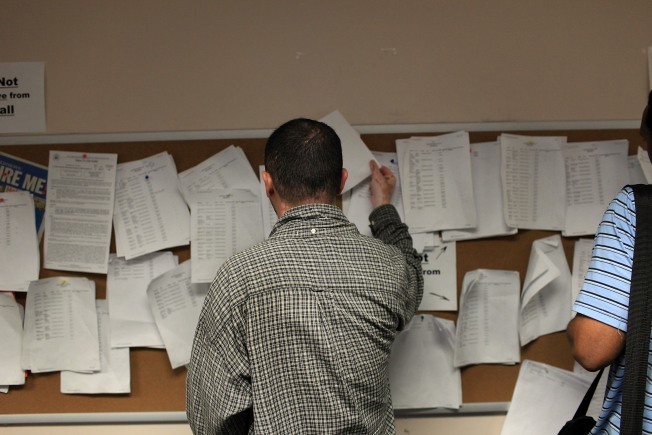 Richard Martinez looks at employment notices on the wall at the New York State Department of Labor employment center. A report from the New York State Department of Labor says the state has seen its first monthly decline of its unemployment rate since April 2009. While the percentage change is small, the unemployment rate dropped to 9.6 percent last month, compared with 9.8 percent in April. This marks a larger change from the same time last year, when the unemployment rate was at a high of 10.5 percent. It squeaks in just below the national unemployment rate of 9.7 percent. At the state level, educational and health services added 31,000 jobs -- the largest increase in private sector jobs over the past year. State government employees also added close to 7,000 jobs as a result of the 2010 Census. New York City made some headway in the fight against unemployment by adding close to 15,000 private sector jobs in May. Most of these jobs were created to offer professional and employment services. While the city continues to add jobs, many of the industries that were hiring many workers earlier this year included construction and restaurants. The report shows that these industries were the biggest decliners in may. The numbers showed that the number of unemployed people in the state dropped to 806,600 in May from 817,100 in the previous month, but it remains relatively high. About 511,400 New Yorkers are still collect unemployment.